Top lot of the day, Edward Moran’s “The Winning Yacht,” sold at $112,500. MILFORD, CONN. – Confirming Sandra Germain’s opinion on auction success, the top lot at Shannon’s Fine Art Auctioneers’ October 25 sale was a painting that came from a local collector, where it had been cared for since it was completed – thus fulfilling the auctioneer and co-owner’s mantra: a high quality painting by a well-known artist that is new to the market will be successful. 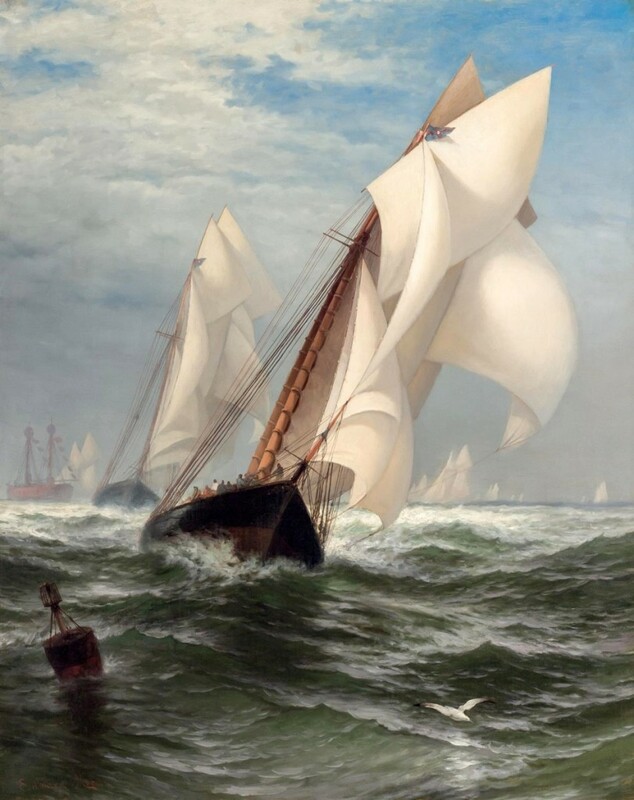 Especially, as was the case in Edward Moran’s “The Winning Yacht,” if it embodies the best of the artist. In a sale that grossed more than $1.8 million and was about 75 percent sold by lot, the American artist Edward Moran’s (1829-1901) painting of The Madeleine and The Countess of Dufferin as they bear down on the marker in a leg of the America’s Cup race reflects the best of the marine artist’s work. 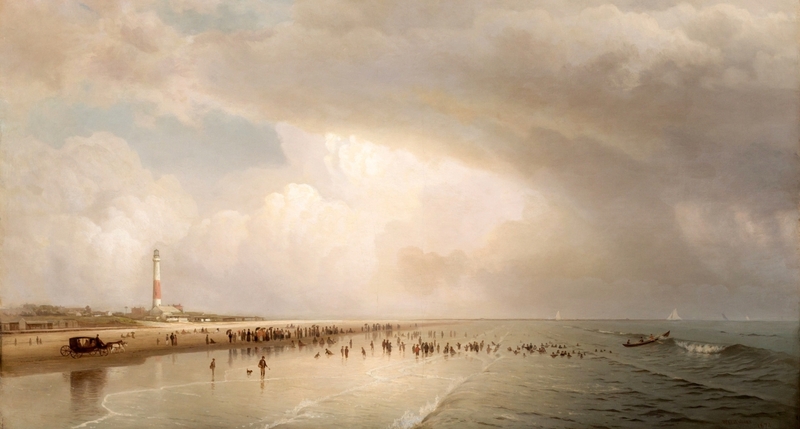 The oil on canvas 40-by-32-inch painting was completed in 1876 and went directly to a private collector from whom it descended to the consignor; it sold at double its high estimate at $112,500. 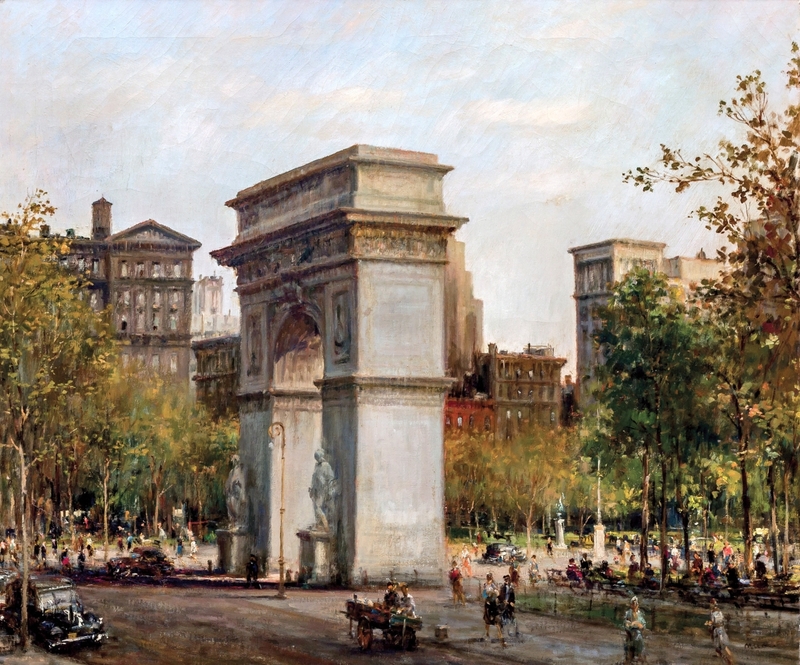 Known for creating intimate views of New York City’s landmarks, Alfred S. Mira’s (1900-1981) view of “Washington Square Park” set an auction record for the artist when it sold at $81,250, far exceeding its $25/35,000 estimate. “It was a desirable subject – the epitome of the New York City landmark,” Germain said. It pulses with the excitement of the city; viewed from a side angle of the monument, the painting captures a moment in time in 1930 with realistic figures and light illuminating the scene. From a private collection, it was fresh-to-the-market. Another trend Germain mentioned is the popularity of Regionalist paintings. Even the Mira could be considered such an example. 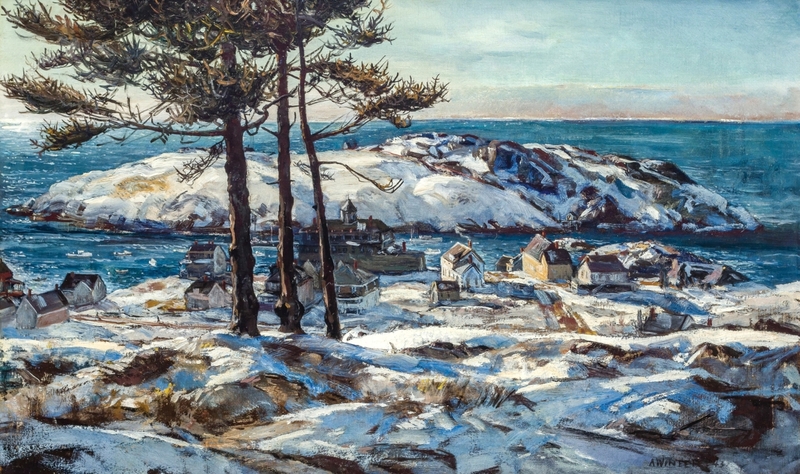 Andrew Winter’s (1893-1958), “Blue Day” (Monhegan Island), is another good example. The oil on canvas, signed and dated lower right “A. Winter ’43,” realized $42,500. 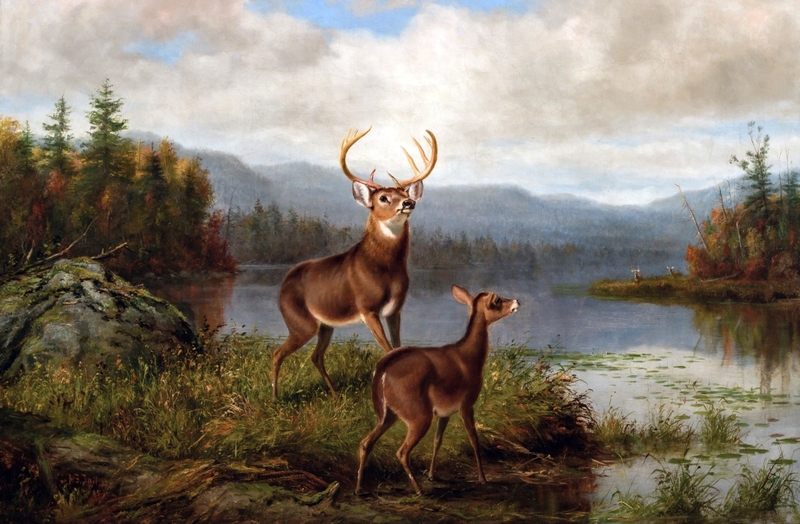 This 24-by-40-inch painting was purchased in a New York City gallery shortly after completion and has descended in a private collection; this is the first time it has been shown publicly since its original purchase. 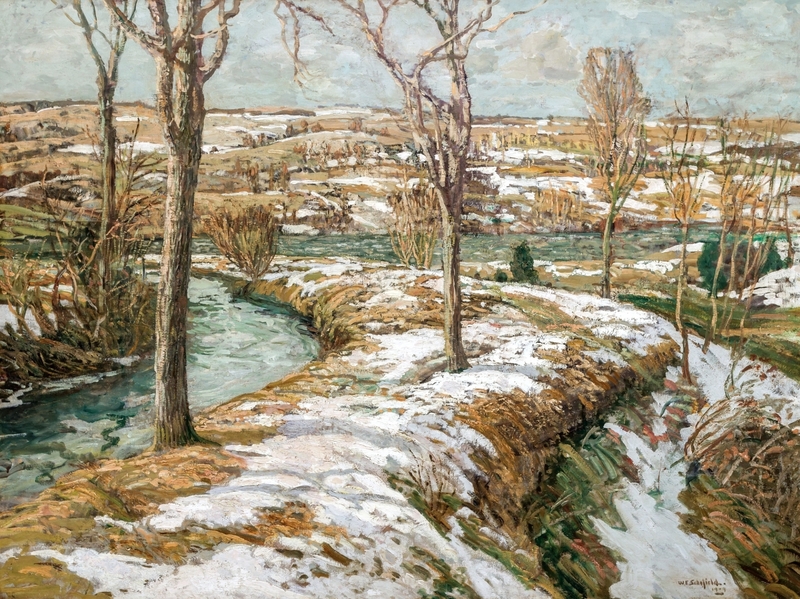 Walter Elmer Schofield’s (1867-1944) “Winter Landscape,” oil on canvas, signed and dated lower right “W.E. 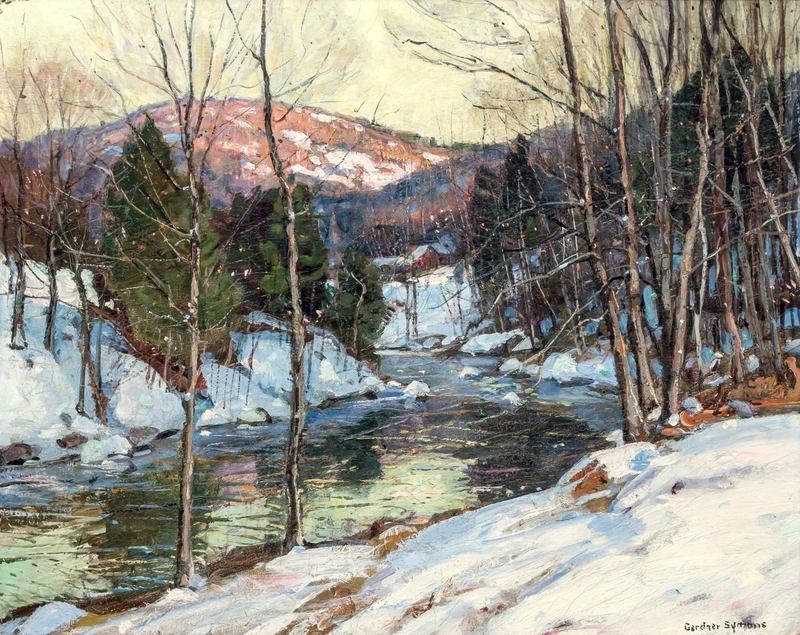 Schofield 1909,” sold at $75,000 (above its $30/50,000 estimate); it was more popular, Germain thought, because the artist painted few winter scenes. 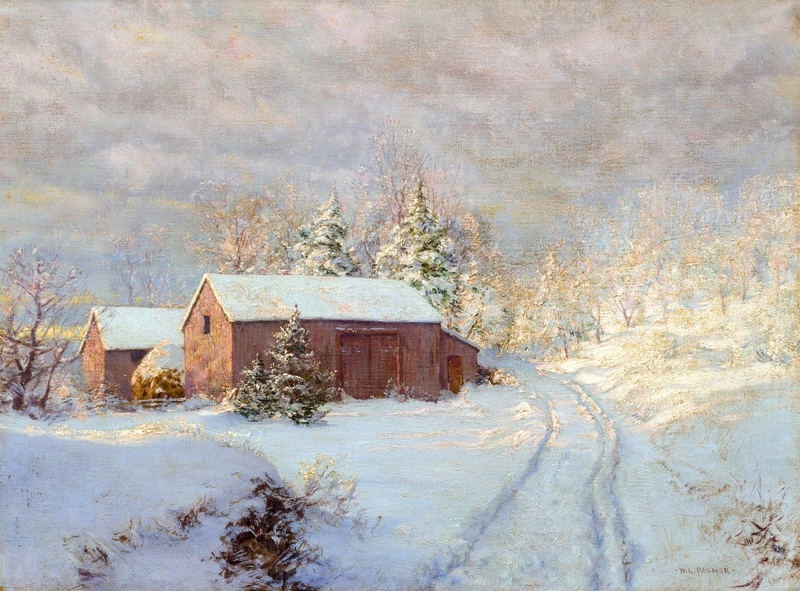 Another winter scene that also exceeded estimate was Walter Launt Palmer’s (1854-1932) “The Red Barn in Winter,” an oil on canvas that sold at $75,000 above a $25/35,000 estimate. The event was successful across all genres of fine art. Germain said that the middle market for art is performing well; she sees lots of activity in the $5,000 to $50,000 range and even above to $100,000. “We had a bank of 14 phones on Jones’ ‘River in Winter,’ the most popular painting in the sale,” Sandra Germain, co-owner of Shannon’s, said. “We had a bank of 14 phones on Jones’ ‘River in Winter,’ the most popular painting in the sale,” Germain said. 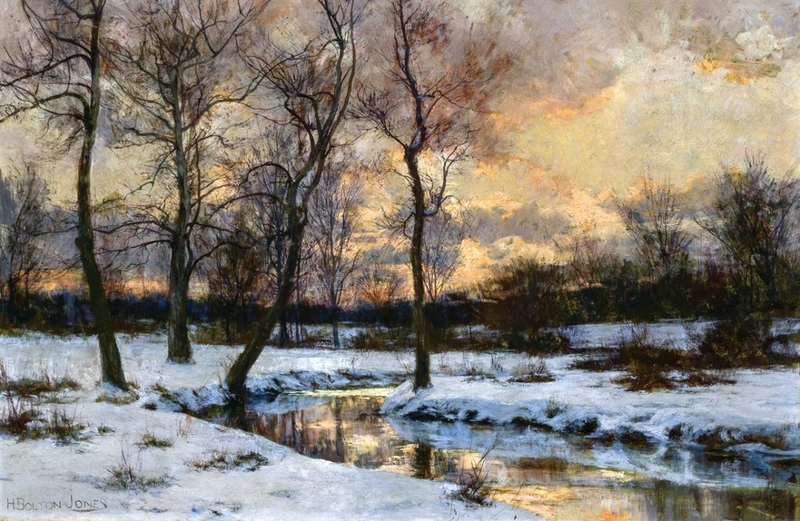 By Hugh Bolton Jones (1848-1927), the 16-by-24-inch oil on canvas sold at $13,750, over a $3/5,000 estimate. Other top lots closed above or within estimate. 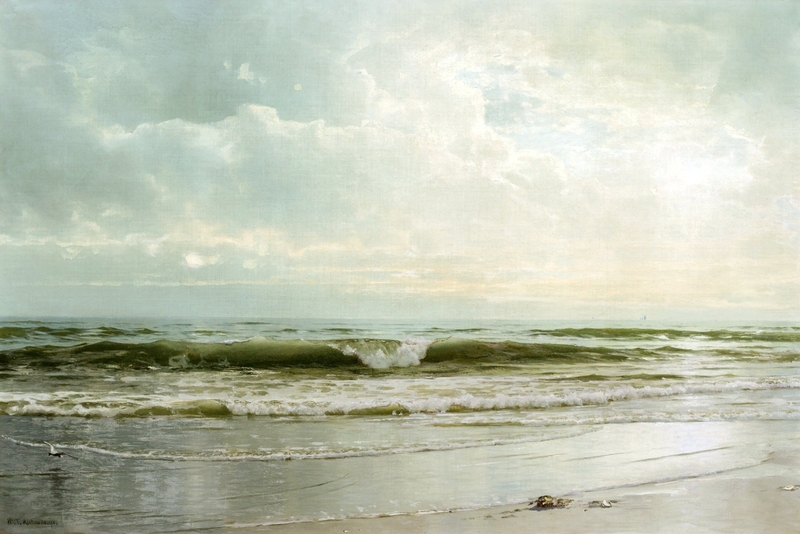 “Seascape,” by William Trost Richards (1833-1905) is such an example. A luminist look at a calm beach scene, it was likely painted at the studio he built on Conanicut Island, Gray Cliff, in 1891; it sold at $65,625 (estimate $60/80,000). Arthur Fitzwilliam Tait (1819-1905), “Solitude, Forked Lake,” oil on canvas, was offered with a $15/25,000 estimate but made $37,500; Laurence A. Campbell’s “View of Wall Street in Winter,” 2001, an oil on panel by the living American artist (b 1939) had a $20/30,000 estimate but was pursued to $35,000. 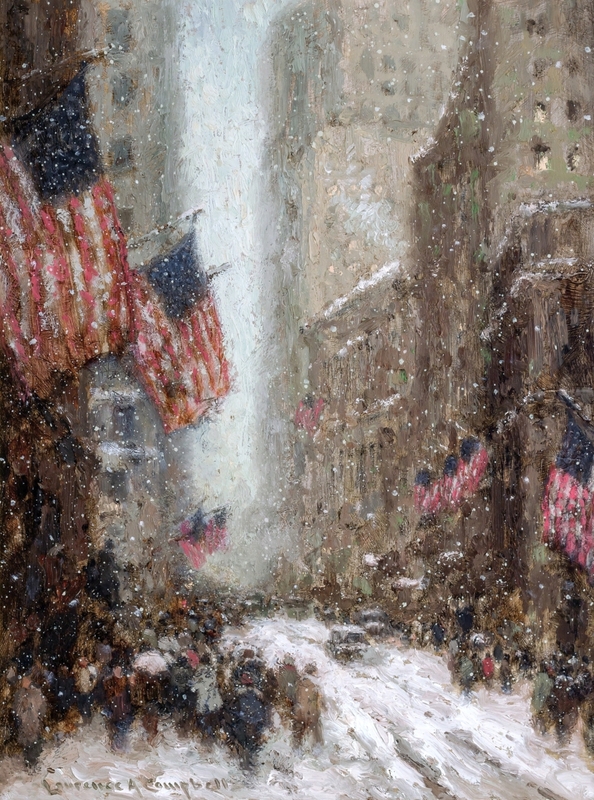 Like the Mira painting, Campbell’s 2001 painting evokes the pulse of the city and his patriotic pride, with figures hustling in the snow and American flags flying all along the street. The work was completed shortly after 9/11. Rounding out highlights of the sale sounds like a who’s who of early Twentieth Century artists; all three works sold at $30,000. There was an oil on canvas by George Gardner Symons (1863-1930), “Late Afternoon, Shelburne Falls,” ($15/25,000); William Willcox (1831-1929), “On the Boardwalk, Atlantic City, New Jersey ($10/15,000); and Karl Horst Hodicke (b 1938), “Ruhefigur – Resting Figure,” acrylic on canvas ($25/35,000). All prices, with buyer’s premium, as reported by the auction house. Shannon’s is planning an online auction for January. Its next cataloged sale, live and online, is set for May. For additional information, www.shannons.com or 203-877-1711. Laurence A. Campbell (b 1939), “View of Wall Street in Winter,” oil on panel, signed lower left, sold at $35,000.